The Report Chooser is used anywhere in the application where the user needs to select a report. Within the widgets, the name of the currently selected report (if applicable) is displayed by default. To select a different report or create a new report, click the Choose a Report button or name of the report. The Report Chooser will open and display available reports. System reports are indicated by the folder icon. User reports are indicated by the person icon. Favorites – Choose from a list of the user's favorite reports. Favorite reports are selected in tile view by clicking the star on the tile. This will change the star to gold, and that report will show up in the Favorites view. Recent – Choose from a list of recently used reports (sorted in reverse chronological order—most recently used first). Browse – Browse all reports accessible to the user. 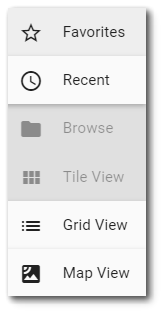 Tile View – This option will display the reports as large tiles (default view). 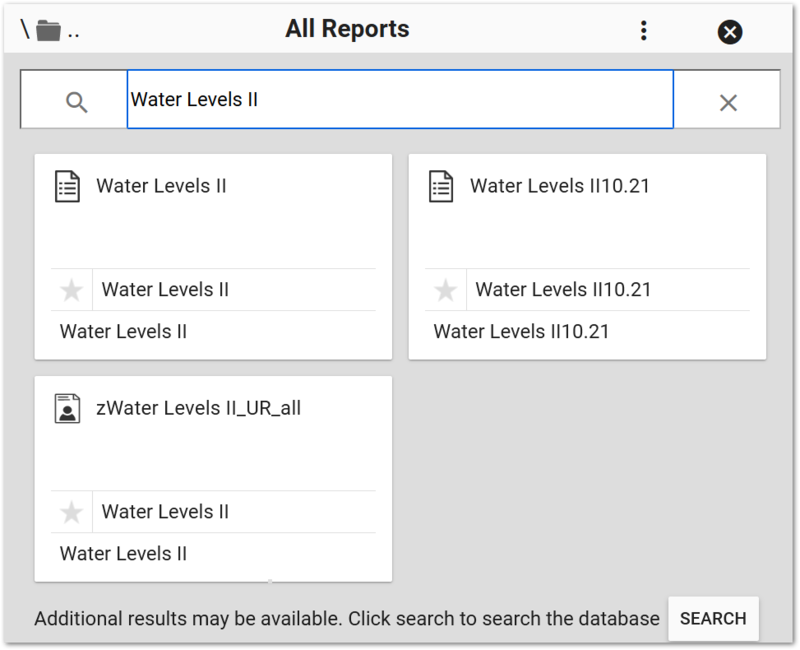 Grid View – This option will display the reports in list form. In addition to the reports name, this view displays the REPORT_ID and owner of the report. The grid view offers a filter functionality similar to the filter functions in EQuIS Professional. Users can filter reports using the Starts With, EndsWith, Contains, Equal, and NotEqual functions for the filter value. Once the desired report is found, simply click on the tile to select the report and close the Report Chooser. Close Report Chooser – The icon closes the Report Chooser without changing the selected report. Search available reports by entering a text string into the search box below the Report Chooser header. The display of reports will be limited to the search string. Note that the search string must be at least three (3) characters; searching one or two characters will not return results. The search field supports a variety of search options. The available search axes include: (1) all the fields in the ST_REPORT and ST_USER_REPORT tables; (2) the pseudo-field name, which is an alias for ST_REPORT.REPORT_NAME, ST_REPORT.DISPLAY_NAME and ST_USER_REPORT.NAME; and (3) the pseudo-field facility, which allows for searching by a facility name. The search parser will separate axes from the rest of the search string, which allows for queries that combine general searches and axes searches. Double quotes can be used around search parameters that have spaces in them. •To search for all user reports that use the Springfield facility, the search string would be report.facility:Springfield. •To search for all reports created by Active Reports, the search string would be report.report_type:rpx. •To search for all user reports with "my reports" in the title and belonging to user with the ID of 3, the search string would be user_report.user_id:3 report.name:"my reports." The Report Chooser can search through all folders, but the search option does not automatically search sub-folders. Thus, reports within sub-folders will not be found. A notice at the bottom of the search window indicates that additional results may be available and when the user selects the Search button, a search will be performed across all folders and sub-folders for any reports matching the search string. The search will temporarily reset the current folder structure. Clicking the icon at the end of the search box will clear the search and reset the user to the folder structure prior to the search. Clicking the Edit button will open the Report Parameter Editor for the selected report. A user with editor permission on the selected report, may update the report. If the user only has viewer permission on the selected report, then any changes made to the parameters will require the report to be saved to a new report. Other parameters may be selected from a list or a calendar as applicable, and can be expanded or collapsed for better viewing. Effective permissions for a report will respect facility permissions. The database function equis.report_facility_id determines the facility associated with a report. The database auth function (i.e., equis.auth) will confirm user permissions are first checked against the facility, before checking permission on a report. If the report is associated with a facility (as determined by equis.report_facility_id) and the user does not have permission to that facility, then they will not have permission to that report (regardless of any other GRANT permissions to the report). If the user does have permission to the facility, then their report permissions are based on the effective permissions on the report (i.e., having permission to the facility does not automatically grant permission to the report). The Report Chooser contains three virtual folders to help in grouping reports: By User, By Facility, and By System Report. These virtual folders break down reports by their creator (By User), by the facility parameter or ST_REPORT.FACILITY_ID (By Facility), and by which report they are based on (By System Report).